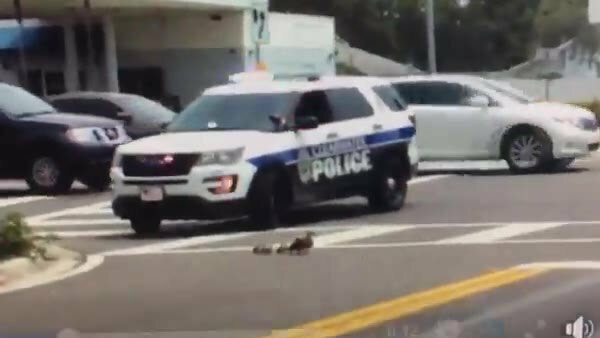 A Clearwater Police Department officer made the quick and tough decision to block traffic on one of this Florida city’s busiest roads Monday afternoon not to respond to a crime but to accommodate very special “guests”- that is, to give way to a family of ducks to safely cross the street. The officer knew right away that the duck family needed some help so he made sure that mother duck and her six babies will safely make it across the road. He accomplished that by turning on his cruiser’s flashing lights and blocking traffic at the intersection of Lake Avenue. Gulf-to-Bay Boulevard can be a very busy area in Clearwater. No one seemed to have complained for the short stalled traffic because of the initiative of the gentleman identified only as Officer Richmond who lent a helping hand to the family of ducks. In fact, one car owner saw Officer Richmond’s kind deed and recorded the incident of the ducks crossing. Peterson passed on the video to the Clearwater Police Department. Good job. Thank God for the law enforcement and security. at least it was corrected. that it was fabricated, unlike the real vile 32258 spews. Thank God for white people.